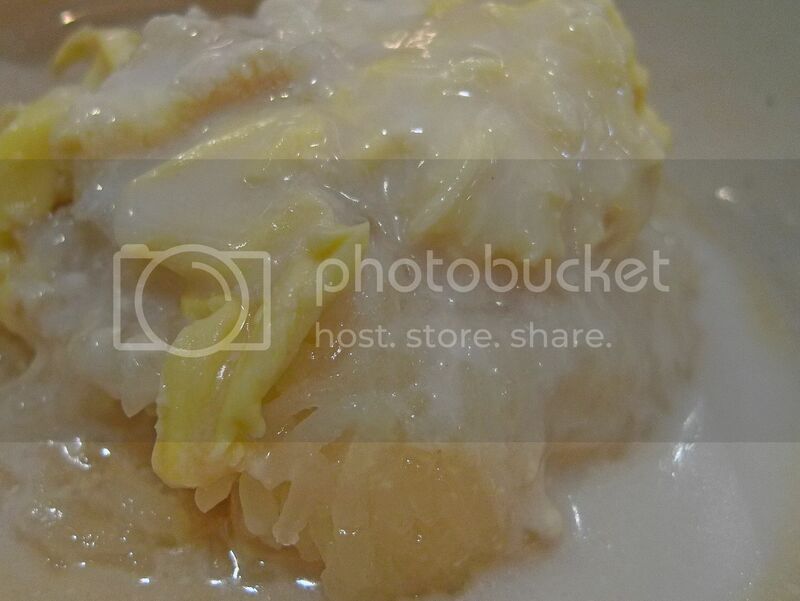 My Very First Blog: The Best Sticky Rice With Durian! The Best Sticky Rice With Durian! I have one favourite dessert which I never get tired of, and that is sticky rice with durian! This dessert, which originates from Thailand, is a must-try, UNLESS you hate durians! I have eaten it at a few restaurants in Malaysia and so far, the best can be found at Erawan Thai Restaurant in Dataran Sunway at Kota Damansara. But even the best in Malaysia cannot match with the one I had in Bangkok during my recent trip and my previous visits there. Guess what? The boss at Erawan did not agree with me. Oh well! So now, let me introduce to you the BEST sticky rice with durian dessert in Bangkok, and probably the whole of Thailand and maybe, the world. I said 'probably' and 'maybe' cos I have to admit that I have not tried every single sticky rice with durians out there. But this one in Bangkok is the best I have eaten so far. And if you ever go to Bangkok, you simply must visit this place! OK, so where is this place that has the best sticky rice with durian? 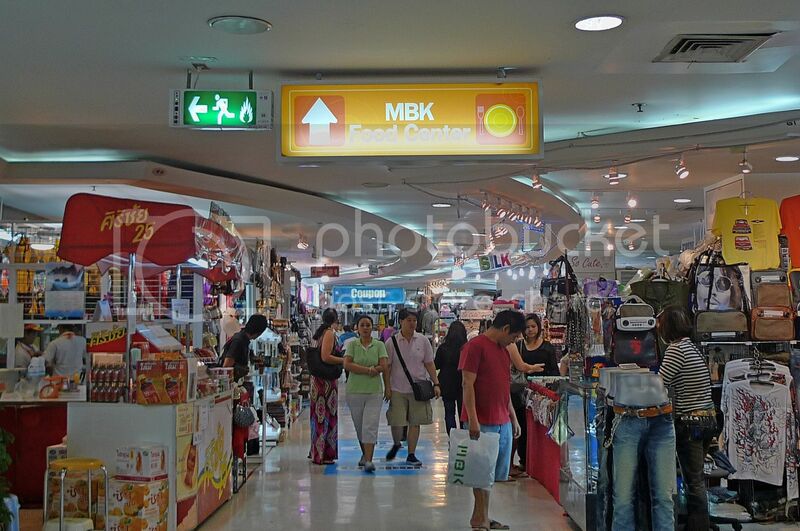 It's at one of the most visited shopping malls in Bangkok - the Mah BoonKrong or MBK Shopping Mall! Ooh! 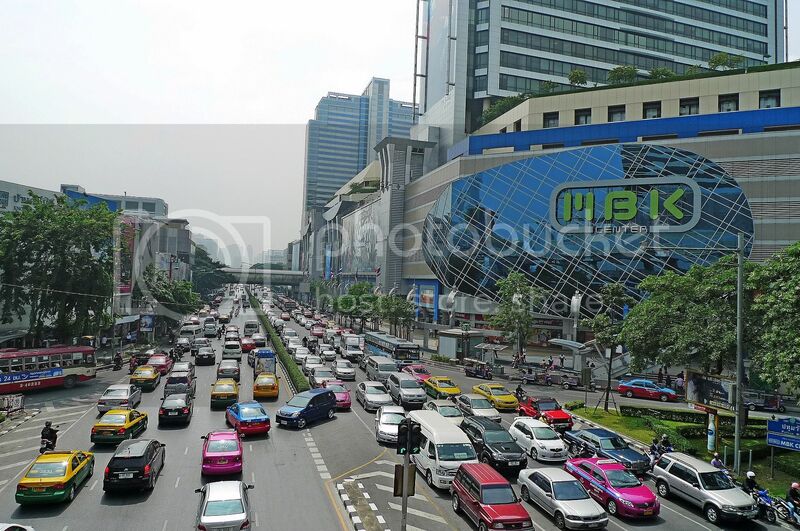 Look at the traffic jam in downtown Bangkok! Looks like KL right? But no worries! To go to this mall, you don't need to take cabs or tuk-tuks, although tuk-tuks can get you there pretty fast as they can weave in and out of traffic like the pros! 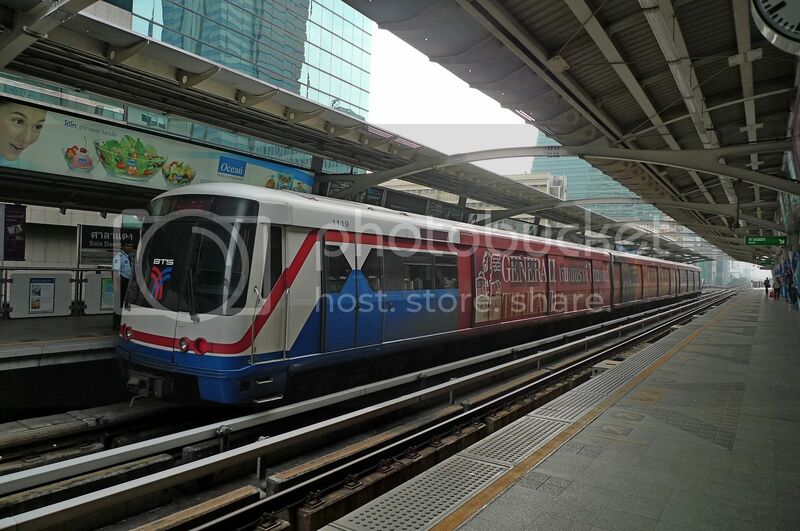 Just take Bangkok's efficient BTS SkyTrain! The Skytrain is similar to Malayia's LRT except that it is slightly wider and more spacious. If you are using the SkyTrain Silom Line, drop off at the last stop at National Stadium station and you can see MBK straight away. OK, enough with the transportation! Once you are in MBK, go to the 6th floor where you can find the Food Center. Hmm, why did my photo turn out like this? Can't see the words Food Center properly! 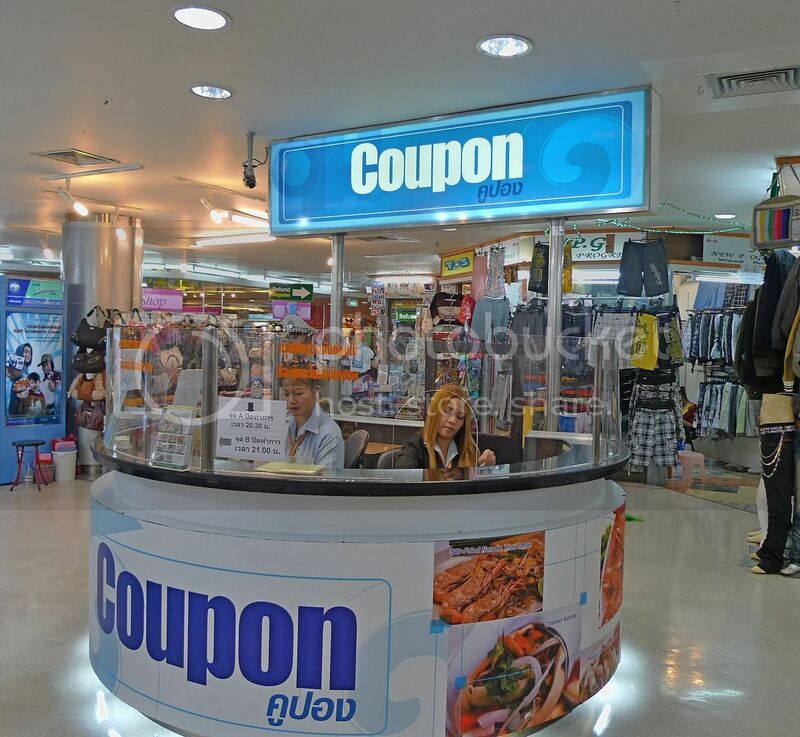 Buy your coupons first from the Coupon Counter. All the stalls in this Food Center do not accept cash. 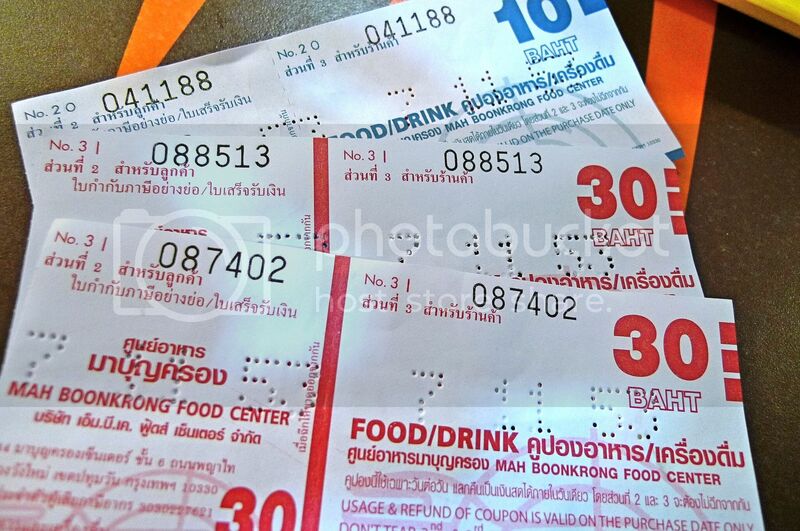 They only accept coupons so you must buy your coupons first. Don't worry. If you can't use all the coupons you bought, they can be returned for cash. OK, there are two stalls that sell sticky rice with durians. You must go to this stall here! Remember this lady! She's the one selling the best sticky rice with durians in Bangkok!! 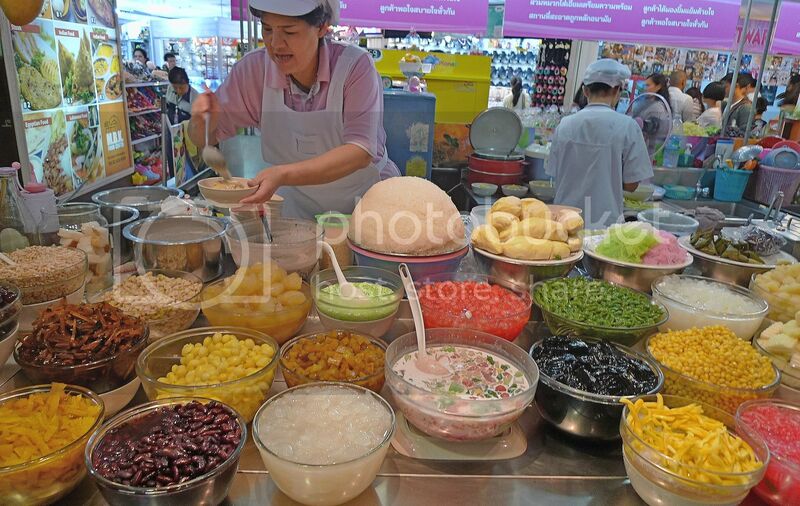 If you are a Thai national or you stay in Thailand and you disagree with me, please, please let me know where I can find an even better sticky rice with durians!! Thank you!! Sorry if the photo is not as clear as it should be. The lighting there was a little dim and I did not want to use flash. Besides, I was taking all these photos very fast as I was actually stopped by the security guard who told me that I was not allowed to take photos. What the heck?! So some of the photos here were taken "secretly" when the guard was not looking. LOL! 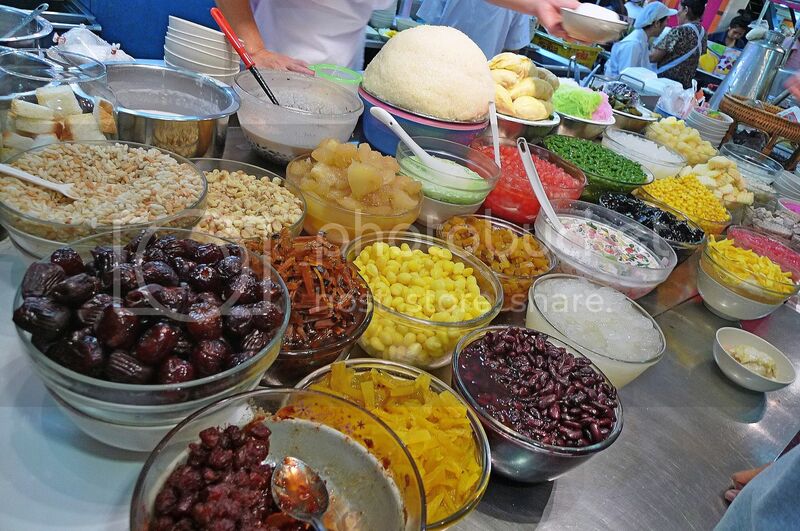 As you can see, besides sticky rice with durian, the lady also sells many other types of desserts! I took a quick snapshot of the menu. Good news for those who don't like durians! You can try the sticky rice with mango, which to me, was also very good! Much better than the ones you find in Malaysian Thai restaurants! 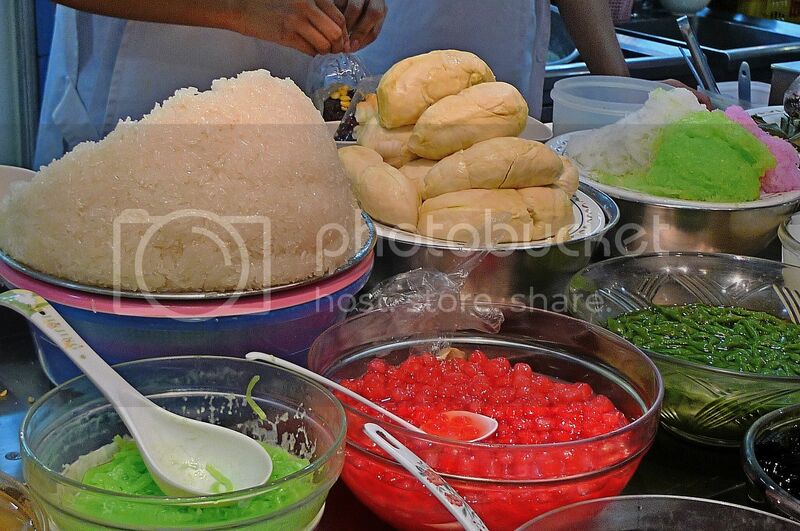 Look at those sticky rice and durians! Maybe the picture here does not make it seem so appetizing, but in reality I was drooling when I was there! The lady has a rival stall just next to hers! Make sure you don't go to the wrong stall! Ok so here's my sticky rice with durian. Gosh!! I can't help drooling looking at my own photo! The combination of coconut milk, sticky rice and durian flesh makes this the perfect dessert! I liked it so much I ate it almost everyday during my trip in Bangkok! And to think it costs a mere 40 baht (RM4) compared to the RM12 price tag eating a similar but clearly more inferior quality version at Erawan Thai Restaurant! Coming up next : The Best Steak In Bangkok! yeeehaw!!!! tot i was gonna miss it he he! The durian sticky rice looks absolutely delish! gosh...all my favourites! durian with pulut, mango.. and santan.. so cholesterolistic! hahaa.. I love sticky rice with mangoes or durian too! Gosh! I'm craving for it now. Where to find stick rice at this hour!? You bad lah! ECL, find in BKK! HAHAHHAHAH! gosh.. so yummy! I absolutely love mango sticky rice!! wooo... sticky rice as in glutinous rice? oh I miss BKK... the Tom Yam there... to die for!! I like the colourful stall. SO much stuff to choose ah? argh gimme a bowl of sticky rice with durian now! Love the mango combination and have not tried with thorny fruit as yet. Yeah what the heck cannot take photos of food? Can understand if you are taking snapshots of display of clothes, interior designs or decor etc for security and biz reasons as they would dont want competitors to copy them or robbers to do 'research' on the surroundings. Perhaps they had bad experiences with 'spy' photographers. When in Bangkok do as the Romans do..haha. The pixz look ok even with out flash. tQ. 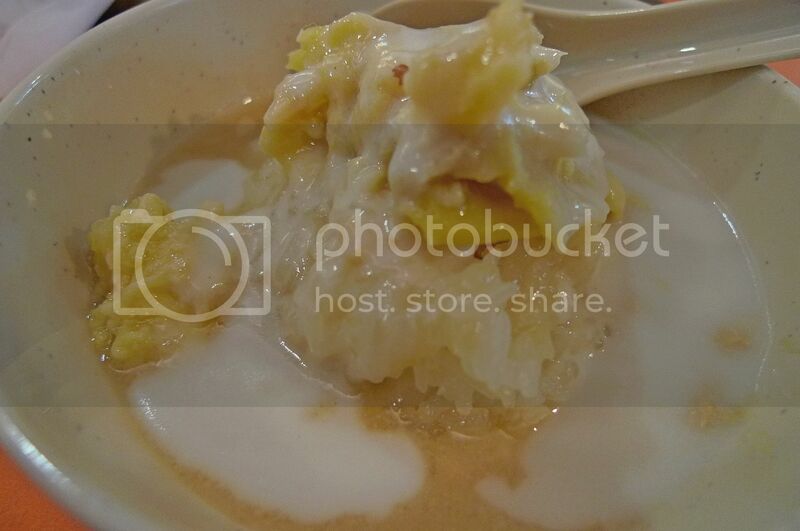 I don't mind having sticky rice pudding with durians but the durians must be the tasty variety. I don't like D24. I can't find good sticky rice pudding with mango over here. Wow! Exotic looking food there. I think I'll pay any amount to taste them. urgh!!! i hate durians!! so i will never try that at all..
but then i love their sticky rice with mango.. they call it "kao niao mak mon", hehe.. and i also like the dessert "tap tim krob" (which is the red rubby with jackfruit)..
and oh, one more thing i like.. but i have no idea what is that called.. it's like green bean paste wrapped in a layer of jelly and then made into shapes of different colorful fruits.. you saw that?? i find that very interesting dessert..
mariuca, congrats you are FC! Oh, so B likes sticky rice with durian? High 5 with B! Haha. kyh, yes lots and lots of coconut milk! Yummy! eastcoastlife, haha!! Too bad, you have to make your own LOL!! monica, if you like durian, you must try sticky rice with durian! I prefer it to sticky rice with mango! bananaz, oh you must try with the durians! They are so delicious! Yeah, I also found it ridiculous that I was not allowed to take photos of the food! But I also took pictures of the interior - maybe that's why. Haha! bluedreamer27, learnt a new word - Biko! Haha. Never tried it with durian? Oh, you must! It is delicious! mei teng, why you don't like D24? I love it!! 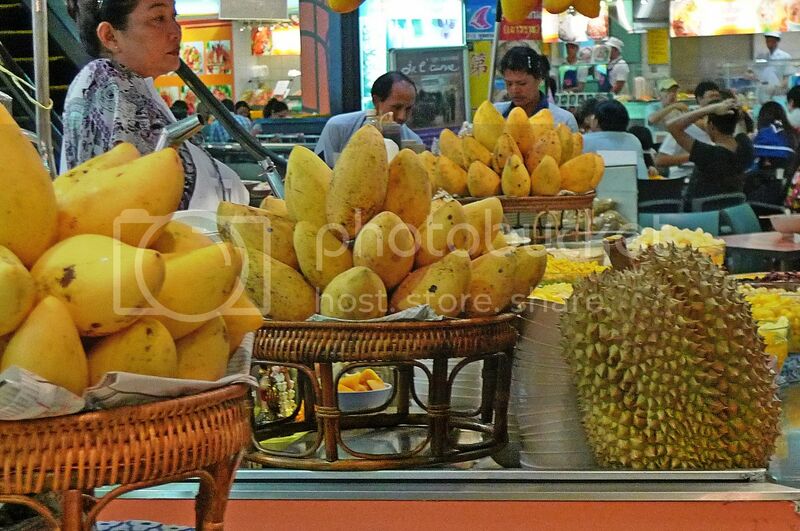 Yes, no good sticky rice with mango here, you must go Bangkok for that! ai shiang, really? I should make them and sell to you for USD1,000! Haha! SK, what a waste to hate durians! They are the most delicious fruit! Haha! Sticky rice with mango is nice, but no match for sticky rice with durians! LOL! I like 'tub tim krob' too! Also hard to find a really good one here! Lok chub? No I have not tried that before! Never tried sticky rice with durian before but they are making me lau hau sui. Funny why they don't allow photograph. wow i haven't had durian sticky rice before. Looks like I gotta give it a try the next time I'm there! I have yet to try sticky rice with durian! But I like my sticky rice to go with mango, yummy! Happy new year, my panda mate! I also love Durian with sticky rice very much. It is important that they use fresh coconut milk with jasmine in the sticky rice. Of course the durian must be fragrant top grade ones. Most Thai durians are too fleshy and flat taste. 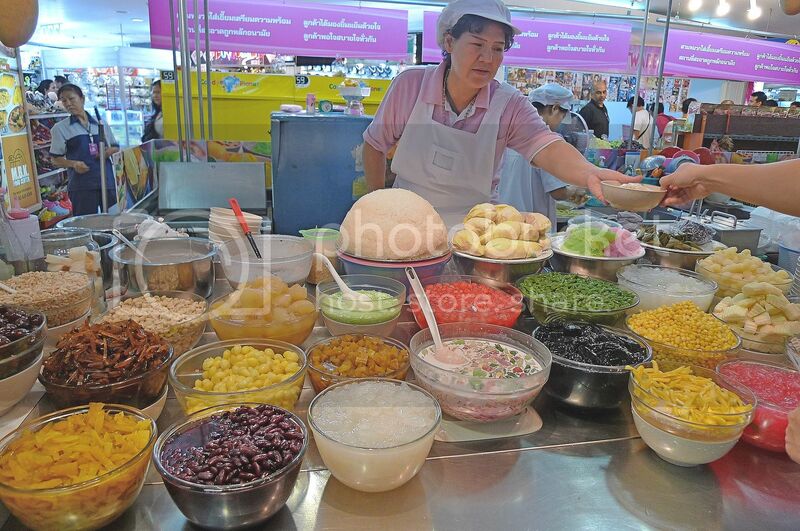 I am surprised you rated that Thai lady's stall as the best in Thailand or the world..!!! Sure boh!??? I have eaten them many times in Thailand since I was born but I would say that you need to try them in Phuket or Songkhla provinces. All the best Thai desserts and curries usually come from the South. Anyway, I agree that Bangkok chefs are good in culinary skills too. Maybe you were so hungry that day and everything tasted superb! Bangkok was famous for trading and nightlife since the olden days. 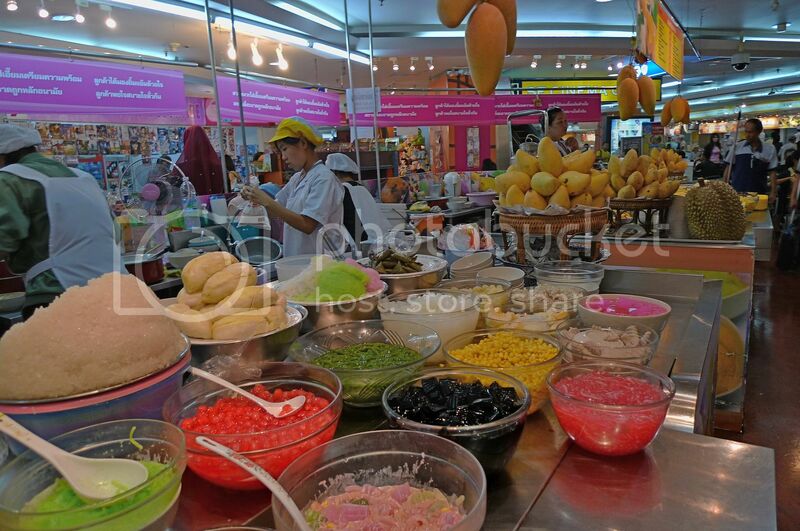 It was during the late 20th century era where exotic Thai food were widely popularized and promoted in Bangkok city. Then HM The Queen started to help promote the OTOP's village handicrafts and silk ware to the Bangkokians and the world. If you were a frequent visitor to Bangkok during the 80s and 90s you would have cursed their heavy traffic jams and madness! We always had to allocate minimum 5 hours to travel to Don Muang airport. Crazee! That sticky rice with durian looks great. I bet it'd taste even better with D24. LOL! Thanks for sharing, Foong. no matter how good you said about the durian I don't think I can take it. The smell is just so overwhelming for me. you're making me hungry. it has been 15 years since i last visited bk. there must be a lot of changes. Holisticlounge, oh really? Well, I guess everyone eats differently. Last time when I went there, they provided lots of durian and it was not dry at all. I am not sure about now though.